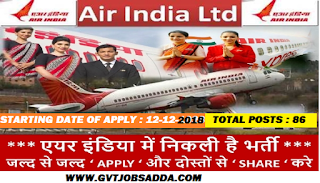 Air India has published advertisement recruitment notification for cabin crew 86 posts.Those candidates who are interested & eligible for Air India cabin crew vacancies candidates may check official website of Air India Recruitment 2018 . 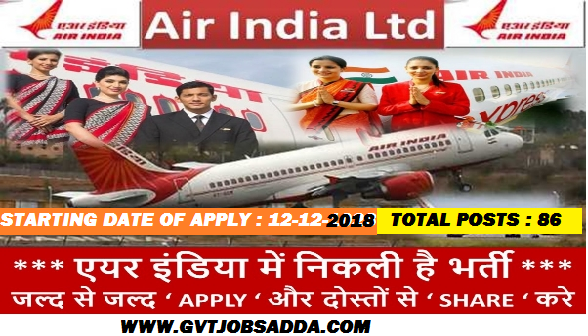 Brief information has given below about Air India Recruitment 2018 Candidates should read official notification before apply online. Candidates would be required to submit the said Demand Draft at the time of Group discussion (Not applicable for SC/ST candidates). Candidates will have to bear the cost of the Pre-Employment Medical Examination(s), which could range between Rs.2,000/- and Rs.3,000/. If any additional tests are required, the additional cost thereof will also have to be borne by the candidate. Candidates who wish to apply, are advised to log on to Careers Page of air india Website: www.airindiaexpress.in and fill in the Online Application Format.